A Waste Transfer Note (WTN) is a document that must be completed when waste is transferred from one party to another; this ensures there is a clear paper trail from when the waste is produced until it is disposed of. You must keep your copy of any Waste Transfer Notes for at least two years and be able to produce them on demand to the Environment Agency or local authority, this is a legal obligation that must be carried out or you may face a fine. We print thousands of Waste Transfer Notes for businesses around the UK. They can be supplied glued into pads, as books which are stapled, spine taped and perforated or as loose glued sets. We offer 2 part, 3 part and 4 part options. 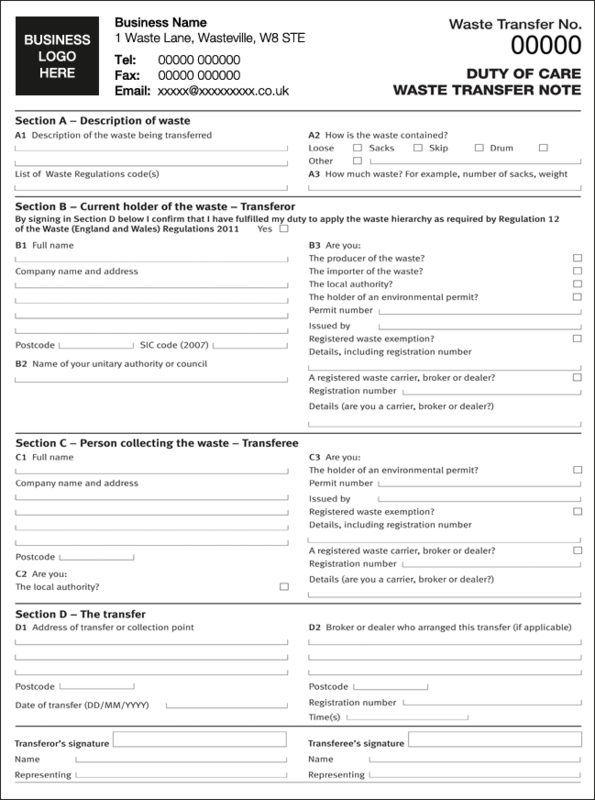 The template on this page can be personalised with your business details or we can design a bespoke Waste Transfer form for you. Alternatively, you may wish to provide your own design for us to print. We can even pre-print some of the fields for you, for example your business address and waste carrier number, etc, saving you from writing this information time after time. If you are moving hazardous waste then you will require our Hazardous Waste Consignment Notes. We have a wealth of experience in printing NCR products and we can accommodate most bespoke requests. If you would like a quote, please get in touch and we will be happy to help.